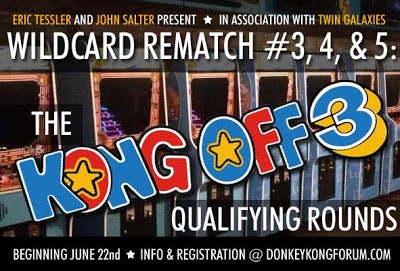 June 20th, 2013 - A few weeks ago I wrote a story for Twin Galaxies, on behalf of Eric Tessler and John Salter, detailing the format for the Wildcard Division at the Kong Off 3. After some back-and-forth on the Donkey Kong Forum, Eric and John made a few tweaks to the format, the community gave a collective thumbs-up, and we're now good to go! There will be three 24-hour "Online Qualifier" tournaments, held bimonthly, starting this Saturday June 22nd. The top 8 overall scores from the three tournaments will get a place in Round 1 of the Wildcard Division on Saturday, November 16th in Denver at the Kong Off 3. Those unable to qualify online, or who don't participate in the tournaments, will have the opportunity to participate in a "Live Qualifier" the day before, on Friday, November 15th. The top 8 scores from Friday will face the 8 online qualifiers on Saturday. The top 8 players from Saturday will then move onto the final round on Sunday, where the top 4 will win cash prizes. The first of the three qualifier tournaments—which, in addition to the chance to qualify, boasts a generous prize pool and bounties—begins at 9 PM (Pacific) on Friday night, and ends 24 hours later. With 50 players signed up already, it's looking to be a huge event! Visit the tournament announcement thread on Donkey Kong Forum for complete details and to sign up. Is Ross going to win again? I hope one of the legends steps back up preferably billy to add to the amazing story of donkey Kong the past few years.